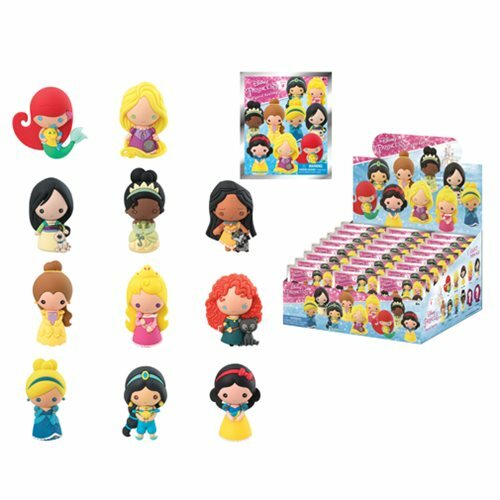 Make sure to get all of the Disney Princesses so that you can finish your collection! This Disney Series 9 3-D Figural Key Chain Display Box includes some of your favorite Disney Princesses as they hold onto a pet or prop from their respective movies. You could get Snow White with a bird, Ariel ( The Little Mermaid) with Flounder, Rapunzel ( Tangled) with a pan, Jasmine ( Aladdin) holding the lamp, Mulan with Little Brother, Tiana ( The Princess and the Frog) and a frog, Cinderella with her glass slipper, Belle ( Beauty and the Beast) holding a book, Aurora ( Sleeping Beauty) with a rose, or even rare chase versions of Pocahontas with Meeko, or Merida ( Brave) with one of her triplet younger brothers as a bear cub!